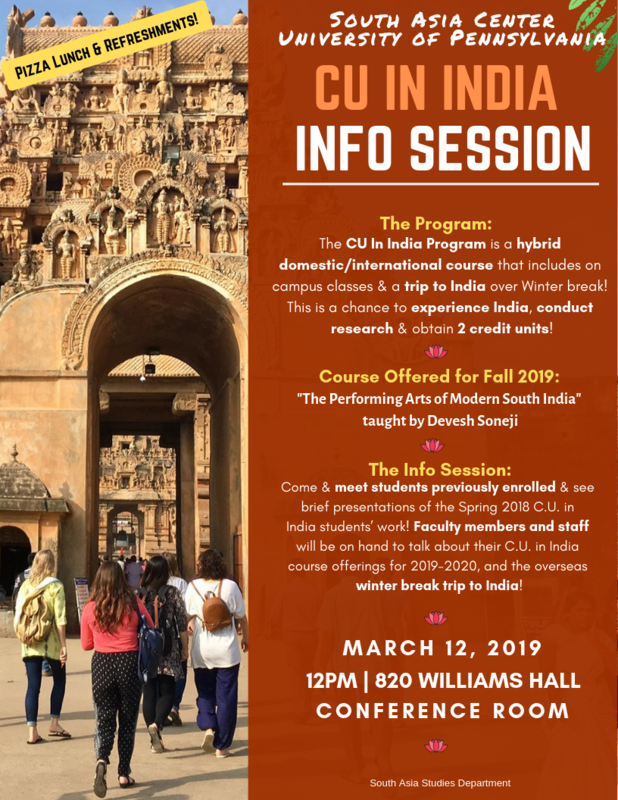 JOIN US for an information session about the upcoming CU In India brid international/domestic course! This Fall we are offering: ""The Performing Arts of Modern South India" taught by Devesh Soneji. This course focuses on the social history of the performing arts in modern South India and their interface with larger discourses on religion, gender, nation, and modernity. The course is centered on three allied performance traditions: Karnatak music, Bharatanatyam dance, and Tamil Kuttu theater. During our visit to India, we will travel to sites associated with performance, including temples and palaces such as those in the cities of Thanjavur and Pudukkottai. We will also spend time in the cities of Hyderabad and Chennai to examine modes of contemporary cultural production in these globalized cities, and travel to small towns and villages such as Mummidivaram to meet with artists from former courtesan communities.